Not so much about the catch... as we didn't catch. 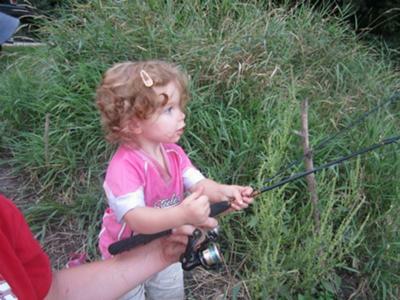 More of the joy in her face as I took my daughter, Prairie (17 months), on her first fishing outing. We fished the Big Sioux River in South Dakota... hoping for a catfish. When I handed her the rod she sure looked like she knew what she was doing. I started my two boys off fishing very young when they were still in diapers. They've always enjoyed it too. I think they've even grown to actually fall in love with fishing more and more all the time. A few months ago, we all went to a family bbq at a park. There was a pond there and so we all went fishing for a little while. To make a long story short, I just about couldn't get the kids off of the water. All they wanted to do was fish, fish, and fish some more. This is just one out of many examples about our fishing trips. They just have such a blast. Anyway, thank you much for sharing this photo ans story with us. We hope to hear about many more stories of Prairie with her first fish, second one, biggest one, and so on.